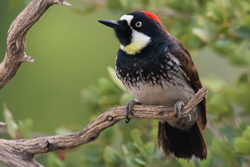 Many of the USA’s finest birdwatching venues are at their best in spring, but Arizona and California offer excellent year round birding and this tour presents a welcome contrast to the gloom of a typical British winter. Southeastern Arizona’s majestic ‘sky islands’ of canyons and mountains rise above the Sonoran desert and are home to a wealth of species ranging from Gambel’s Quail to Painted Redstart. In contrast, the coastal zone of southern California offers a quite different environment with a number of avian specialities, amongst them Black Oystercatcher, Black Turnstone, Surfbird and Wandering Tattler. 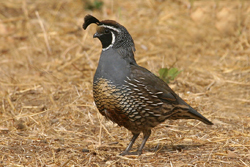 In addition there are a number of other local specialities on offer, such as: California Quail, Nuttall’s Woodpecker, California Thrasher, Wrentit and California Gnatcatcher. The deserts of both states have many special and distinctive species of their own such as Cactus Wren, Greater Roadrunner, Gilded Flicker, Pyrrhuloxia, Curve-billed Thrasher and the more difficult to locate Crissal, Sage & Le Conte’s Thrashers. The oak and pine clad mountain slopes harbour a number of excellent species, including Red-breasted & Pygmy Nuthatches, Williamson’s Sapsucker and Townsend’s Solitaire. We will spend time exploring the San Diego coastline, Anza Borrego State Park and the Salton Sea in California. In Arizona, Madera Canyon, Patagonia Lake State Park and the grasslands of the San Rafael Valley - an important wintering area for many species will be explored. 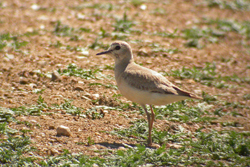 From Sierra Vista we will look for wintering raptors, Sandhill Cranes and Mountain Plovers in the Sulphur Springs Valley and visit the San Pedro Riparian National Conservation Area, an excellent site for wintering sparrows and finches and the birds that prey on them. In fact, raptors will be very much in evidence throughout, many of them occupants of grassland fence posts and roadside power poles. The very best of winter birding in the USA ! Day 1: Flight from UK to Los Angeles, where we arrive in the early evening. Days 2 & 3: We start our birding in the San Jacinto Mountains where target species at lower elevations will include Wrentit, California Towhee, California Thrasher and California Scrub-Jay. As we progress we will look for Nuttall’s & Acorn Woodpeckers, Band-tailed Pigeons and Oak Titmouse. Higher up, White-headed & Hairy Woodpeckers, Red-breasted Sapsucker and Pygmy Nuthatch are all possible. In the San Diego area we will visit tidal flats, rocky coastline and scrub to look for a number of specialities including Western & Clark’s Grebes, Pacific Loon, Glaucous-winged Gull, Brandt’s Cormorant, Surfbird, Wandering Tattler, Heerman’s Gull, California Gnatcatcher and Golden-crowned Sparrow. Days 4 & 5: Heading eastwards on our way to the Salton Sea, we pass through the marvellous Anza Borrego State Park where we should encounter a number of desert species, perhaps including Gambel’s Quail, Ladder-backed Woodpecker, Cactus Wren and Black-throated Sparrow. Although created by man, the Salton Sea is an oasis for wildlife, attracting a multitude of birds: wildfowl are numerous and as many as 15 species of ducks may be present as well as Snow & Ross’s Geese; waders should include American Avocets, Black-necked Stilts, Long-billed Curlew and Least Sandpipers. 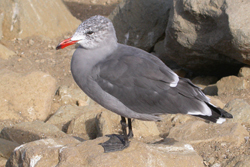 Amongst the many California Gulls we will look for the sought-after Yellow-footed Gull. 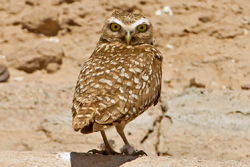 More desert species in this area could include Burrowing Owl, Inca Dove and Crissal Thrasher. Day 6: After breakfast we’ll drive east into Arizona, stopping en route at the Paloma Ranch to look for species such as White-tailed Kite, Prairie Falcon, Burrowing Owl, American Pipit, Horned Lark and Mountain Bluebird. Days 7 - 9: On Day 7 we head for Tucson, en route passing through the Santa Cruz Flats where Mountain Plovers will be among our targets. 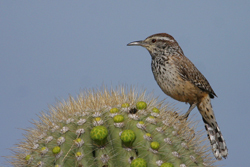 From our base in Tucson we visit the Arizona-Sonora Desert Museum, where typical species include Gilded Flicker, Anna’s and perhaps Costa’s Hummingbirds, Greater Roadrunner, Cactus Wren, Pyrrhuloxia and Black-throated Sparrow. 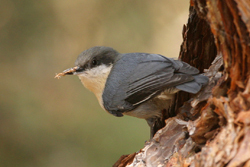 We will also explore the pine-clad slopes of Mount Lemmon, which provide habitat for White-breasted & Pygmy Nuthatches and Red-naped Sapsucker. An excursion to the Sweetwater Wetlands may reveal Harris's Hawk, Sora, Black Phoebe, Common Yellowthroat, Brewer’s & Yellow-headed Blackbird. Days 10 - 12: We drive to Sierra Vista for a three-night stay. Whilst at Sierra Vista we have two full days to explore the area. 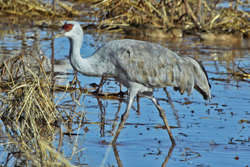 We will visit the Sulphur Springs Valley, a haven for wintering Sandhill Cranes and Snow Geese, many raptors including Golden Eagle and Prairie Falcon plus Mountain Bluebirds and Mountain Plovers. We will look for longspurs and sparrows in the San Rafael Grasslands and if time permits for Abert's Towhee and maybe even Green Kingfisher in the San Pedro Riparian Reserve. Days 13 & 14: On Day 13 we drive to Green Valley. En route we may visit Patagonia, Sonoita Creek, Patagonia Lake State Park, Kino Springs and/or the Paton's. A visit to Madera Canyon, will give us the opportunity to see such species as Rufous-winged Sparrow, Arizona & Acorn Woodpeckers and perhaps Painted Redstart. Nearby, Rufous-capped Warbler and Black-capped Gnatcatcher are also possible. Day 15: Catch our return flight to the UK, arriving on Day 16. Includes: Economy class scheduled return flights (UK - Los Angeles; Phoenix - UK), accommodation based on twin occupancy, all meals, all ground transportation in USA and services of leaders.